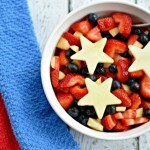 This simple Red White & Blue Fruit Salad Recipe with Citrus Vinaigrette allows your to bring a little patriotic flair to your next get together without a lot of prep work. Summer, grilling season, and family time is well under way now. This summer is passing by more quickly than I’d like it to and the upcoming week that I thought was so far away just two months ago, is now upon us. My cousin Kasey and her family are coming down to visit and stay with us for the first time ever this coming week. When we started talking about their visit, they let us know that the 4th of July was their favorite holiday and implied we were on the hook for making it epic. I don’t know if we can possibly achieve epic standards, but we’re definitely going to try! I’ve been experimenting with small things we can do to make the day patriotic and special and came up with this recipe! It’s red white and blue and even has stars! 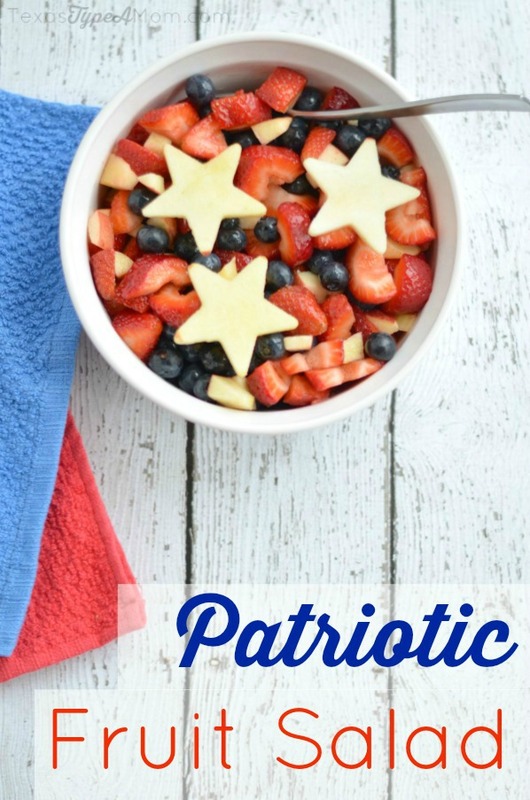 Our family loves it and hopefully this Patriotic Fruit Salad recipe will make a fun statement on the 4th of July! Alternate halving and slicing strawberries and place in large serving bowl. Slice apples and use mini star shaped cookie cutter for apples, set aside. Whisk together all vinaigrette ingredients and drizzle on fruit salad. 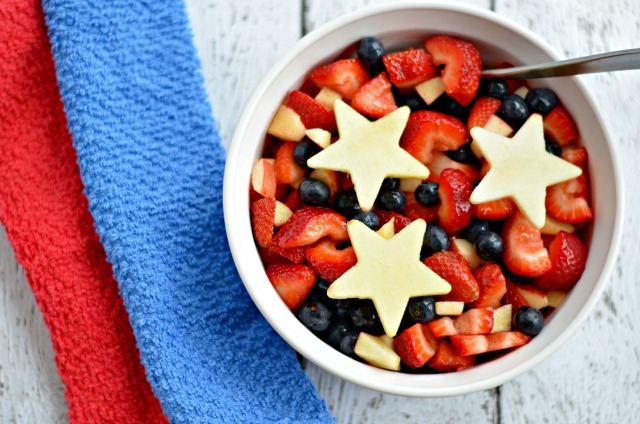 Top with prepared apples cut into stars. For even more ideas to serve on the 4th, check out my Patriotic Dipped Pretzel Rods recipe! What’s your go to red, white, and blue recipe? For all things red, white, and blue make sure to follow my Patriotic Board on Pinterest! That looks great!! I want it right now, for breakfast. I love the star shaped apples. This is so pretty! Love the apple stars. What a neat idea. The star shape really make this a perfect dish for the 4th. So cute. I love that you used fruit to make a healthy treat with natural red white and blue colors, and the starts out of apples is awesome! Kids would LOVE that! That looks beautiful and so festive. I really love how you photographed it, too. It makes me want to run to the farm market, buy fruit and make my own! Thank you! So pretty and tasty! Love the apple stars. This looks so beautiful and refreshing. I love the apple stars! This fruit salad looks so tasty! I’ll have to make it some time soon. This sounds so yummy! I love, love, love Honey Crisp apples….and I’m really liking the vinegrette too. Thanks!